When I began my trip to Japan & South Korea, one of the key things I wanted to do was experience a Japanese baseball game in Fukuoka. South Korea has its own baseball league called the Korean Baseball Organization (KBO). 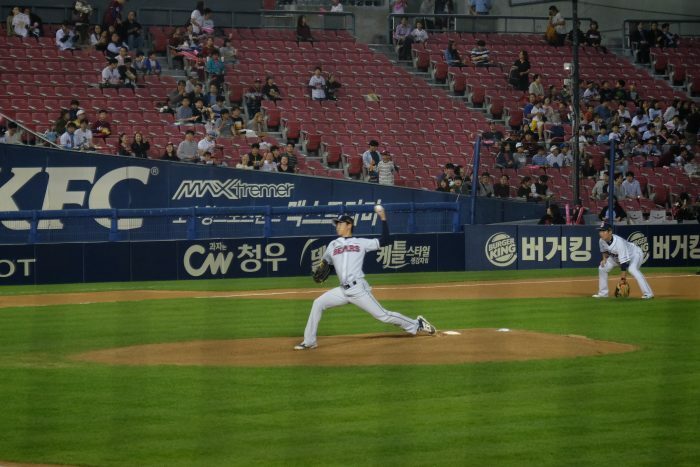 When I visited Seoul, I was able to see a Doosan Bears KBO game at Jamsil Stadium. Jamsil Stadium is located east of Gangnam. It’s a little far away from where most visitors to Seoul will be staying, but it’s easily accessed by subway via Sports Complex station. One nice thing about attending a KBO game is that the tickets are cheap. I was able to walk up to Jamsil Stadium an hour or so before the game and get a ticket near first base for just 15000 won (around $14 USD). 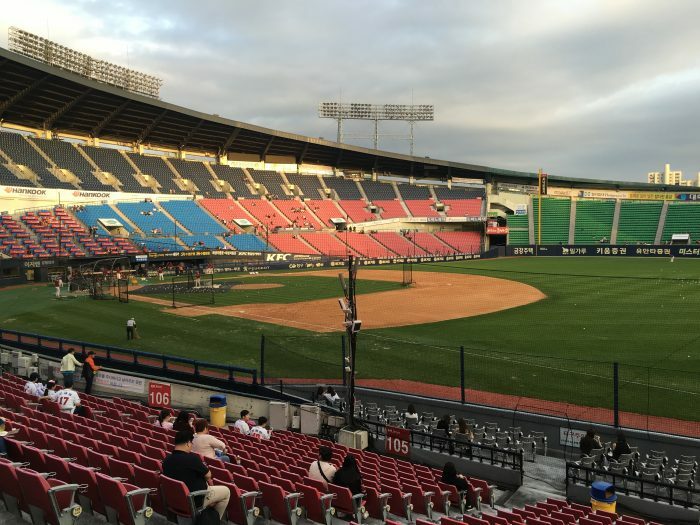 Other seats were even cheaper, making going to a KBO game even cheaper than Minor League or Spring Training games in the United States. 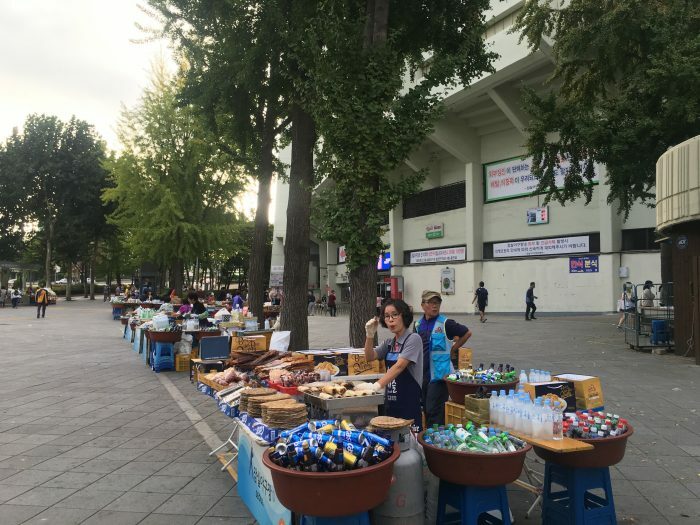 Outside of the stadium, there were vendors selling fried chicken, drinks, and other snacks. 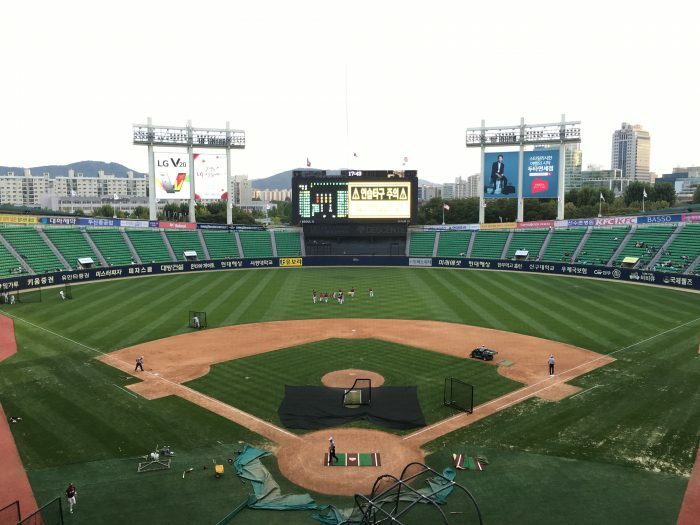 The ballpark itself is on the small side, however it is notable as it was the site of the baseball tournament in the 1988 Summer Olympics in Seoul, which was won by the United States. 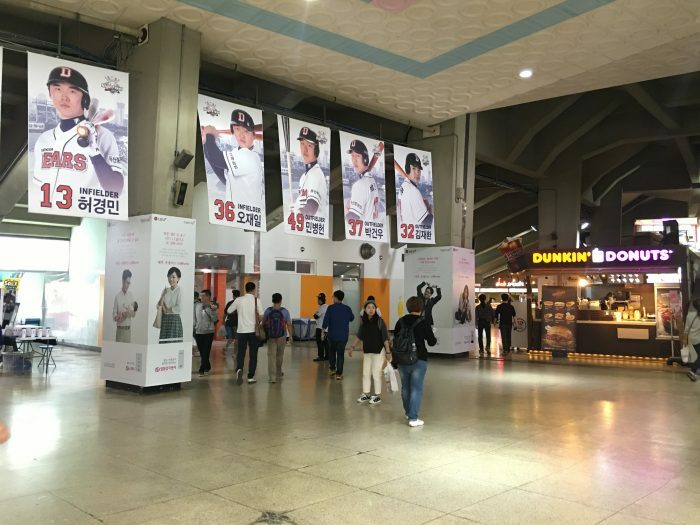 Jamsil Stadium is now shared between two teams, the Doosan Bears & the LG Twins. 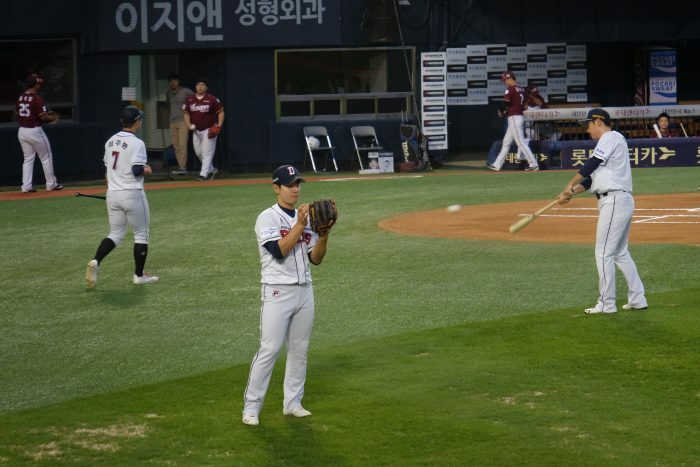 Doosan had won the Korean Series the previous season, and would in fact go on to repeat in 2016 as well. 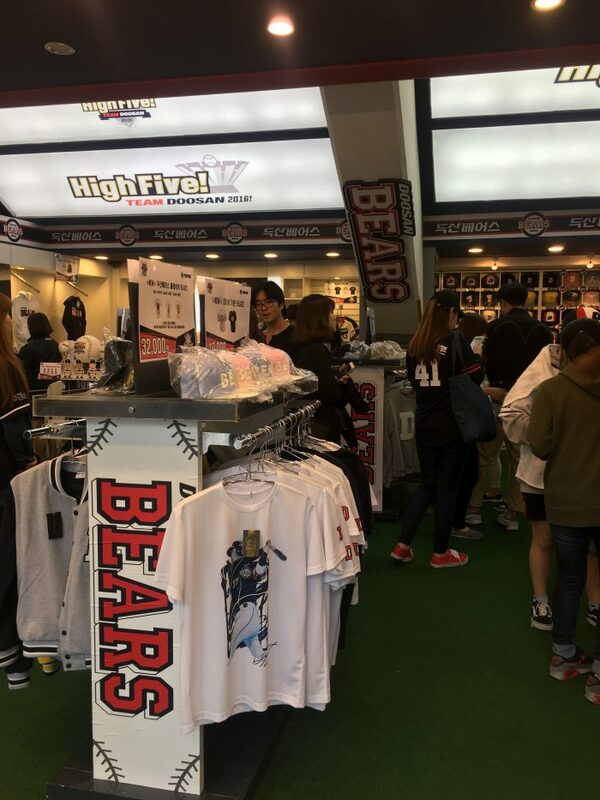 Inside the stadium, there are more vendors. 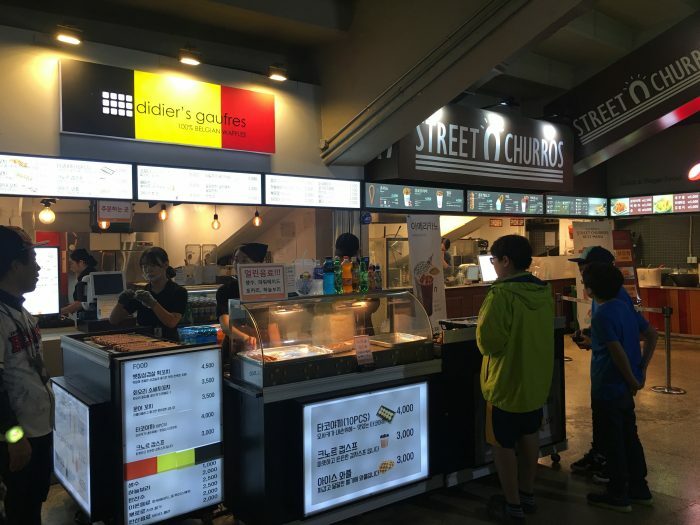 Churros & waffles bring an international flair to the offerings, but there are some uniquely South Korean items as well. The concourses are separated into different infield & outfield sections, so consider that when you are purchasing a ticket. 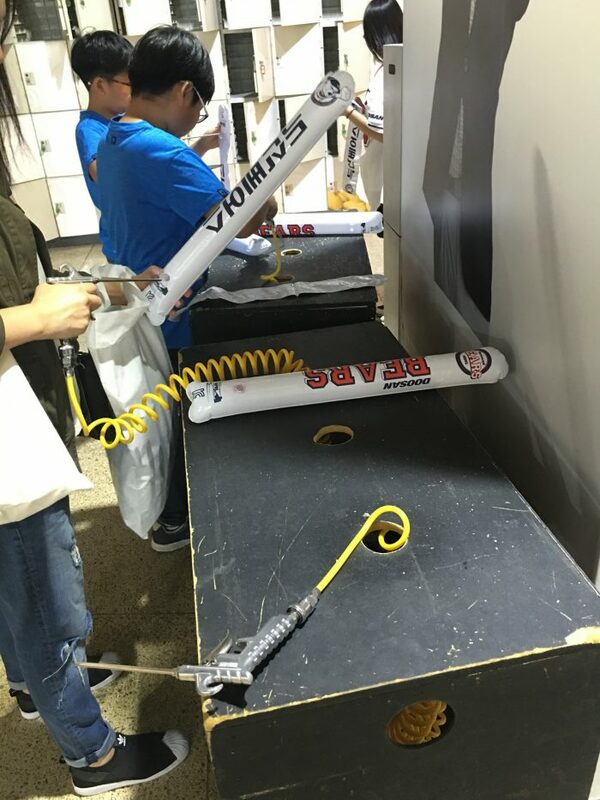 There were even machines for inflating thundersticks. 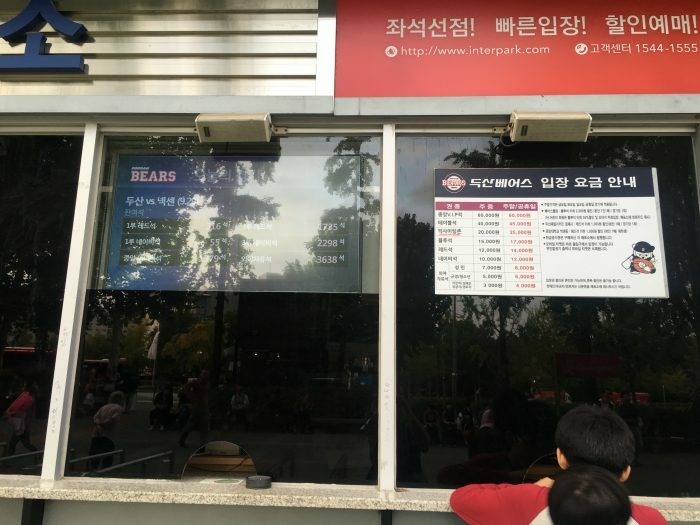 It’s not just the tickets to KBO games that are cheap. Beer is sold in 1 liter plastic bottles for just 3500 won. Unfortunately, the best description of Cass beer would be to remove the “C”. My seat had a great view of the action from field level, even though I was looking through a net. The home bullpen was right below me. 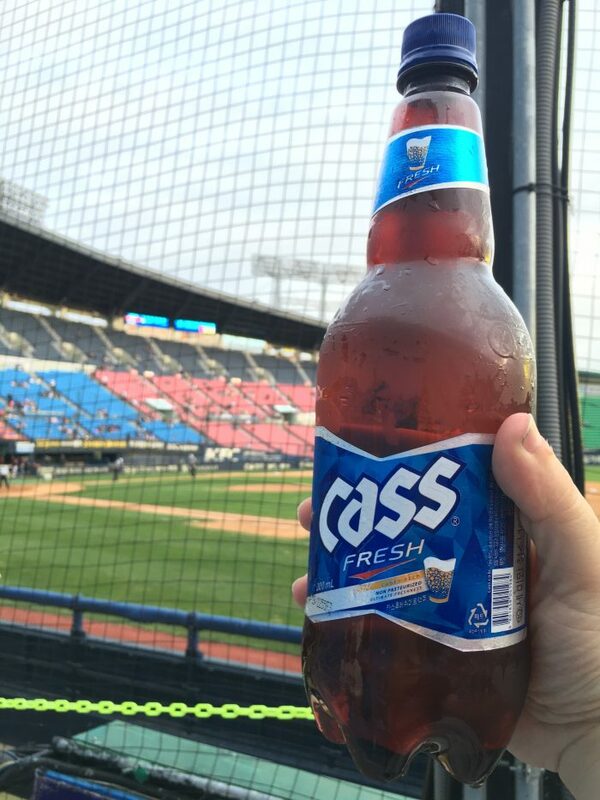 Overall, the Korean baseball experience is somewhere between that of the American minor leagues & Japan. In some ways, the atmosphere is laid back like the minor leagues. The crowd was fairly sparse. 25 minutes before the game, the stadium lights still weren’t turned on. On the flip side, there was plenty of drumming & flag waving, plus there were songs and chants for the players, just like in Japan. 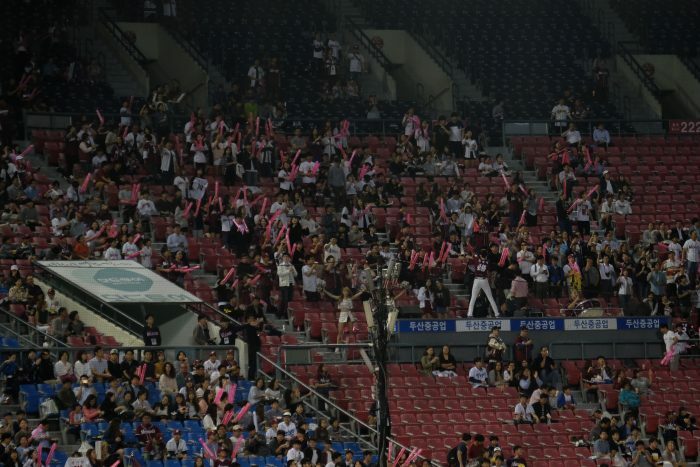 One way that the KBO differs from other baseball leagues is the popularity of bat flips. 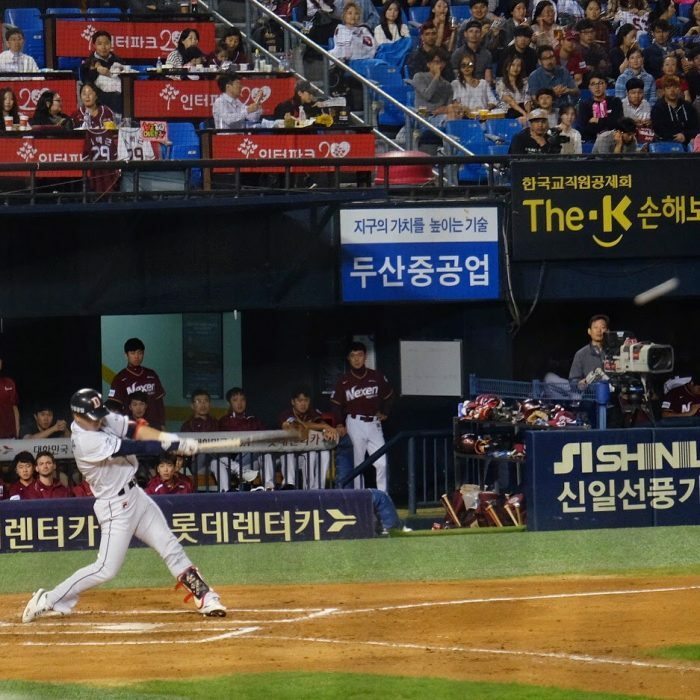 After hitting home runs, Korean players are famous for flipping their bats into the air. In the United States, such a response is likely to provoke a bench-clearing brawl. I am pro-bat flipping, which is one of the reasons why I was excited to go to a KBO game in Seoul. It wasn’t too long after the game started that I got my wish. 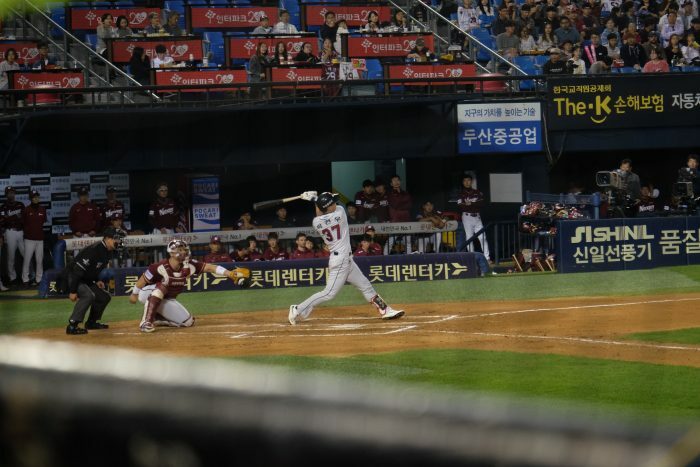 Doosan hit a home run to take a 1-0 lead. The ball only just cleared the outfield fence, so it didn’t lead quite to the bat flip that it would have if it had been a no-doubter, but the hitter made a bit of a flip nonetheless. Not long after, the Nexen Heroes had some flips of their own. After having tied the game, a 2-run homer put them up 3-1. 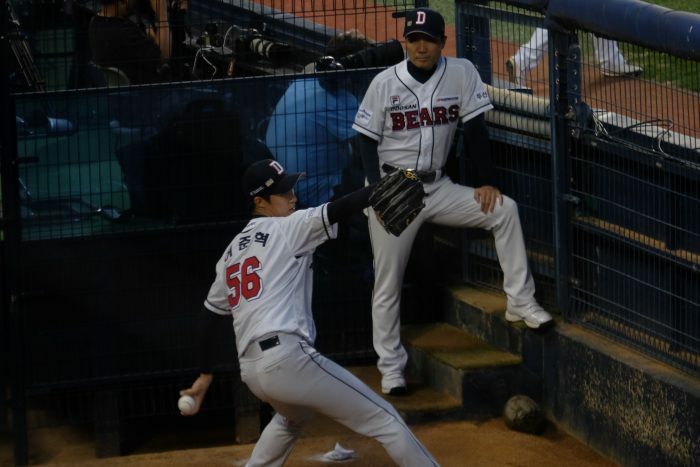 A 3-run homer in the 4th inning gave them a 6-1 advantage over the Doosan Bears. 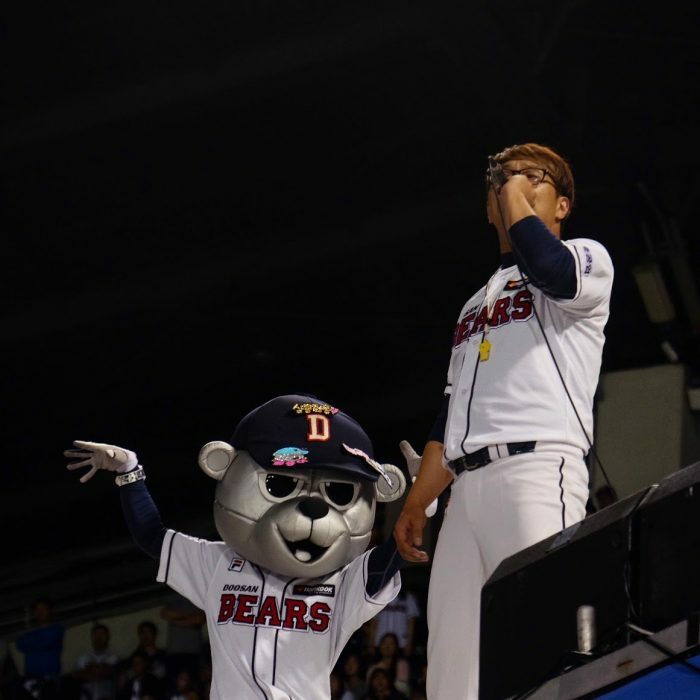 The overall Doosan Bears game experience at Jamsil Stadium is pretty fun. Yes, they have a creepy robot-looking mascot. In the middle of the 4th inning, there was a contest to see who could drink a beer the fastest. The two women competing downed their pints with impressive speed. This sort of competition would never be allowed in the United States these days, and we are worse off as a country because of it. I was also amused by the fact that #69 for Doosan’s warmup music was Limp Bizkit’s “Rollin'”. Everything about that is great. In the top of the 6th, there was another beer drinking relay. Since the game was a blowout, I left not long after the 7th inning stretch, opting instead to head for some craft beer in Gangnam. During the 7th inning stretch, the fans created a cool effect by putting their camera flashlights into the air. Attending a KBO game is a pleasant way to relax outside on a nice night in South Korea. If you’re a baseball fan, you’ll enjoy the action (unless you’re uptight about bat flips, of course). 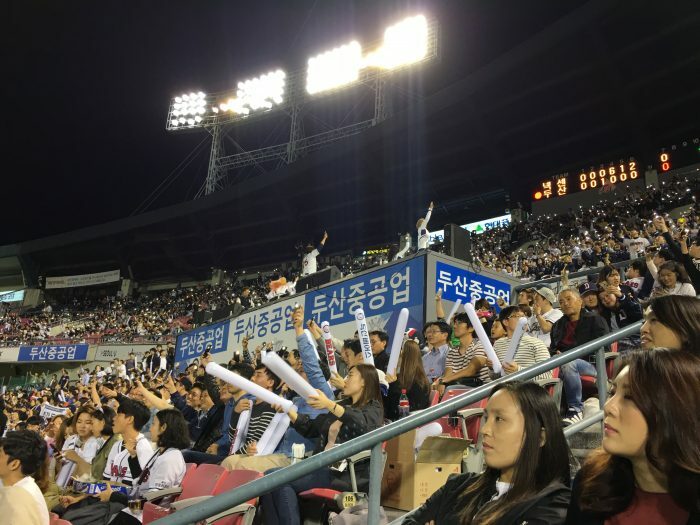 Even if you don’t care about the game itself, going to a Korean baseball game still has plenty of entertainment for everyone.